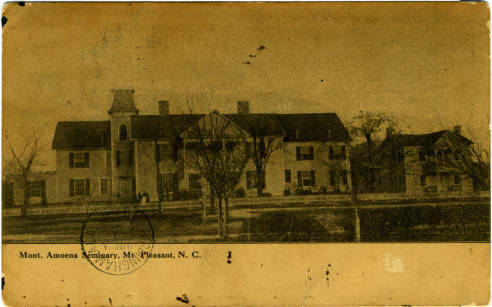 Mont Amoena Seminary in Cabarrus County was founded by Mrs. D. H. Bittle in 1859, under the name Mount Pleasant Female Seminary, as a private liberal arts academy for girls of high school age. It first consisted of one two-story frame building. The school was acquired by the North Carolina Lutheran Synod in 1869 and continued to educate both day students and boarders in fields including English, Latin, mathematics, and music. Many of its headmasters were Lutheran ministers. After the Civil War, it became popular with parents in Concord, and according to one source "was an island of culture in the difficult years" that followed the war. In 1892 the school's name was changed to Mont Amoena Seminary, the name being the Latin equivalent of Mount Pleasant, the location of the school. The school's original multipurpose frame building was destroyed by fire in November 1911, and a new three-story brick building with white columns and modern amenities was constructed on seven acres near the old site at a cost of $30,000. In 1927, after more than 65 years of educating young women, Mont Amoena Seminary was closed, largely because of worsening school finances and improvements in the local public schools. Several years thereafter, its male equivalent academy, Mount Pleasant Collegiate Institute, also closed its doors. Mont. Amoena Seminary, Mt. Pleasant, N. C. , ca 1908. Image courtesy of the North Carolina Collection. Available from http://dc.lib.unc.edu/cdm/singleitem/collection/nc_post/id/1489 (accessed November 2, 2012). Contrary to the accepted version of the founding of Mt. Pleasant Female Academy, Mrs. D. H. Bittle was not the founder. She was the first principal and was hired by a Board of Trustees who, using the model of the nearby Western Carolina Male Academy, gained the support of the NC Lutheran Synod to open a school for girls in Mt. Pleasant. Mrs. Bittle was responsible for establishing the culture of the school, but remained in her position for only about 1 year before the Civil War resulted in the suspension of classes at both academies. Thanks for sharing your interest and question. I am replying to you by email with a list of suggestions for resources where you may be able to compile information about schools in Mt. Pleasant during the time periods you mention. I hope this helps and good luck with your research!